It’s been unusually warm in the United States in recent days, with records being set across the country. But it’s been scorching in Greenland, with temperatures as much as 54° above normal, which means above freezing in many places. And this comes on the heels of new research from NASA’s aptly-named Oceans Melting Greenland (OMG) mission, which finds that the enormous ice sheet is far more unstable than we realized. That’s bad news because the Greenland ice sheet contains enough land-locked ice to raise sea levels by over 20 feet. The heat wave began out west last week, with large parts of California sweltering in the 90s. As but one example, the National Weather Service Los Angeles tweeted on Nov. 22 that the 99°F reading at Camarillo Airport in Ventura County not only broke the record for that day (by 9°F), but broke the record for any day that month. 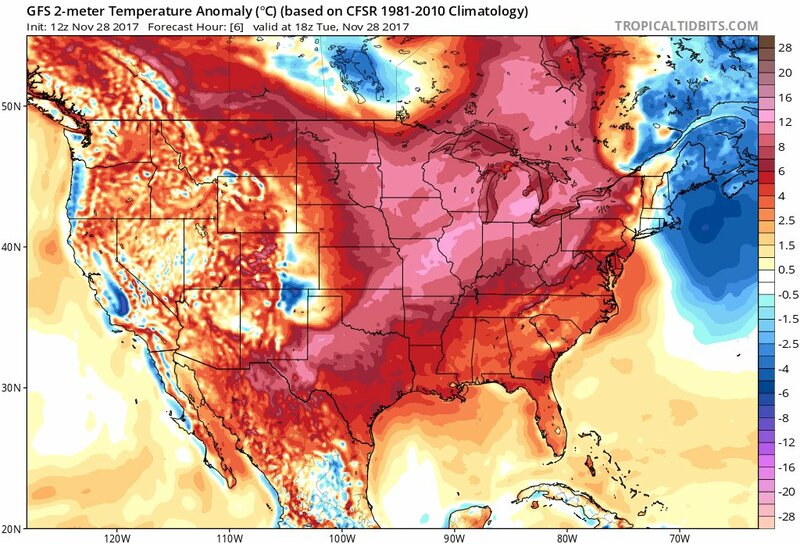 In late November, a major heat wave is a welcome event in large parts of the country, with temperatures in the 60s in large swaths of the south and with Minneapolis hitting the upper 40s. But in a place like Greenland, a monster heat wave this time of year pushes temperatures above freezing. It hit the upper 30s in many coastal towns — with rain forecast in some — which meansactual melting over parts of the great ice sheet that should be adding ice right now, not losing it. Significantly, a study earlier this month by NASA’s OMG mission looked at the threat from underneath the ice sheet, specifically “how marine glaciers react to the presence of warm, salty Atlantic Water” (see figure below). The Geophysical Research Letters study found “new pathways by which AW [Atlantic Waters] can access glaciers with marine-based basins, thereby highlighting sectors of Greenland that are most vulnerable to future oceanic forcing,” which is worsened by global warming. They found that “between 30 and 100% more glaciers are potentially exposed” to Atlantic waters than had been previously thought. The bottom line is that over half of the entire ice sheet may be at risk from this underwater melting. We knew that global warming is leading to more of the kind of monster heatwaves that intensify and extend the surface melt season on Greenland — the kind it is now experiencing. But we are learning that global warming poses a potentially larger risk to underwater melt from warming ocean waters. America’s trillion-dollar coastal property bubble could burst “before the sea consumes a single house.” Here’s why. The more we learn about climate change and the threat it poses, the more urgent aggressive action to slash carbon pollution becomes.